If you are an individual store, a chain of stores, or a distributor, you are eligible to purchase wholesale cookies from Laura’s WJF. 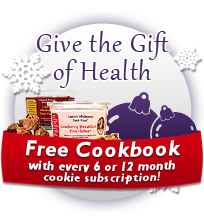 You can choose to purchase wholesale cookies direct or go through one of our distributors. We have nationwide distribution through a variety of distributors and also provide direct shipping. For wholesale cookie discount pricing for individual stores and chains ordering directly, please contact us at 949-412-6932 or email us at info@lauraswholesomejunkfood.com. A minimum of ten cases is required when ordering wholesale cookies. You can also obtain special pricing when ordering by the pallet (210 cases to a pallet). On-going customer support, demo and POS signs, and passive demo samples are offered to our wholesale customers. Up to one case of passive demo samples are provided free of charge for every ten cases of product ordered. We work with several regional and national distributors. For a list of national distributors or regional distributors in your area, please contact us at 949-412-6932 or email us at info@lauraswholesomejunkfood.com. Both ideal with no gluten ingredients interest! If you have any questions about our wholesale cookie line, please contact us at 949-412-6932 or email us at info@lauraswholesomejunkfood.com.